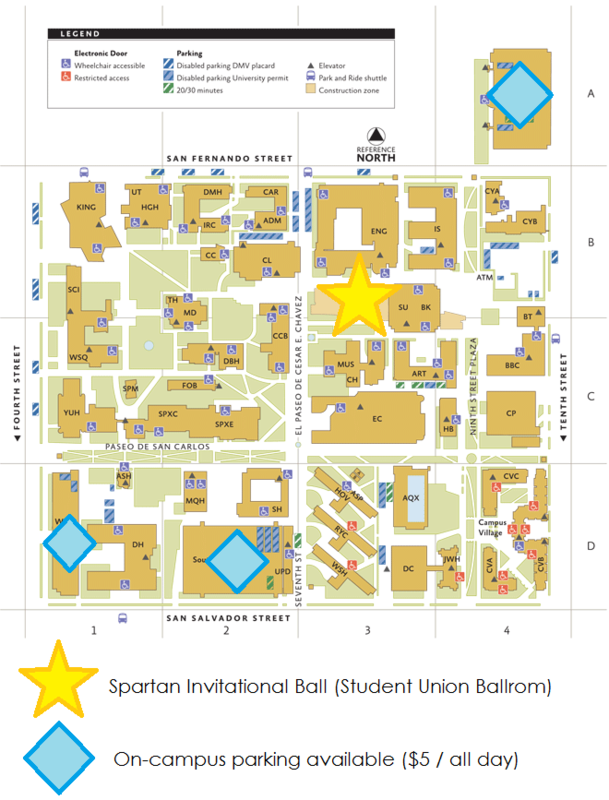 The Spartan Invitational Ball will be held in SJSU’s new Student Union ballroom. Here is a link to the Google maps location for SJSU. Highway 101 to the Highway 280 north interchange Highway 280 to Seventh Street exit north, make a right turn; cross San Salvador and left into Seventh Street Garage. Highway 280 to Seventh Street exit north (left turn coming from north, right turn coming from south); cross San Salvador and left into Seventh Street Garage . Highway 680 south to Highway 280 north; Highway 280 to Seventh Street exit north, make a right turn; cross San Salvador and left into Seventh Street Garage . Highway 880/17 to Highway 280 South interchange; Highway 280 south to Seventh Street exit north, make a left turn; cross San Salvador and left into Seventh Street Garage. Take Guadalupe Parkway (becomes Highway 87) south to I-280 southbound. Exit at Seventh Street. Turn left on Seventh Street to campus. Transit buses and the lightrail line connect to downtown San José and the campus from throughout the county, the airport and the Amtrak/CalTrain San José depot. Call 408-924-7433 (San Jose State University transportation) for specific routes. South garage: Located at 7th street and San Salvador. This is the closest garage to the event. West garage: Located at 4th and San Salvador. North garage: Located at 10th and San Fernando. Parking is $5 all day on weekends. Reentry is allowed. More parking information can be found here.